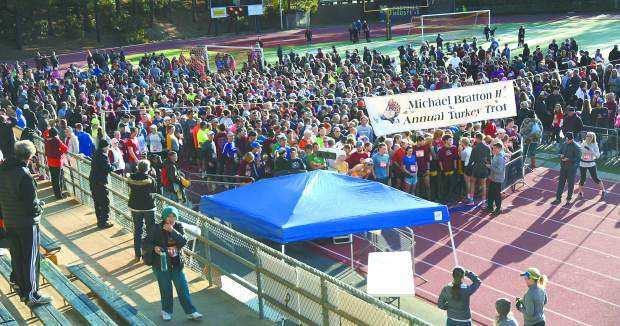 Around 3,000 runners and walkers participated in the 11th annual Michael Bratton II Turkey Trot in 2016. Since 2006, the Turkey Trot has raised around $350,000 for community causes including Anew Day, local youth activities and depression and suicide awareness and prevention. The Michael Bratton II Turkey Trot is back for its 12th installment of what has become a Thanksgiving Day staple in Nevada County. The annual 5K and 10K fundraiser run has become a local tradition, drawing thousands of people to Nevada Union High School each year to kickoff the Thanksgiving holiday with some exercise and support for a good cause. The event has continued to grow each year, starting with 600 in 2006 to nearly 3,000 participants at last year’s run. Now on the precipice of its 12th running, Mike Bratton said the run is still going strong and doesn’t see the event going away any time soon. The Turkey Trot is a massive undertaking and Mike Bratton said it couldn’t be done without the support of his family, the more than 100 volunteers and more than 100 sponsors. “We want this to be a community run, and we’re so thankful for all the help,” he said. There is still time to register and there is also a walking option for those interested. Online registration is available at meb2turkeytrot.com, in-person registration is available from noon-2 p.m. Wednesday at Nevada Union’s Wrestling Gym, and race-day registration will be available starting at 7:30 a.m. Thursday. The race gets going at 8:30 a.m. The Turkey Trot is also the final race in the Gold Country Grand Prix’s 10-race series that began in March.